Over spring break of 2015, went to the “We are Hmong (Peb Yog Hmoob) Minnesota” at the Minnesota History Center in St. Paul. The event celebrated the 40th anniversary of the Hmong’s migration to Minnesota. I attended the event with my parents, who were part of migration after the Vietnam War in Southeast Asia. It was a great experience to see actual pictures and artifacts that date back to how life was like before, during, and after the war. The exhibit helped me understand some of my parents’ unusual behaviors that I noticed while I was growing up. For example, I now know why my parents have a big obsession with gardening/farming and why there is a collection of bamboo baskets stored the basement that has never been used before. Furthermore, after the exhibit I have learned to value and appreciate my family’s history, the history of the Hmong people, and their journey in North America. 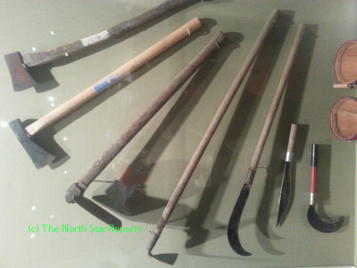 Gardening/farming was the main occupation that many Hmong people had when they lived in Southeast Asia. From my parents’ experience, farming was a full-time job consisting of about eight hours of farming plus another four to six hours of walking to and from the farm. That would be a total of twelve to fourteen hours of transportation and farming every single day. My parents’ farm in Laos was not close to home, so they would get up every day and walk about three hours to get to the farm before sunrise. After farming all day, they would head back to the village during sunset to get home before dark and then the farming routine was repeated the next day. Due to my parents’ upbringing as farmers, this fact/experience explains why my parents have a big passion for farming. To them, farming is a way to remind them of how life was like in Laos. 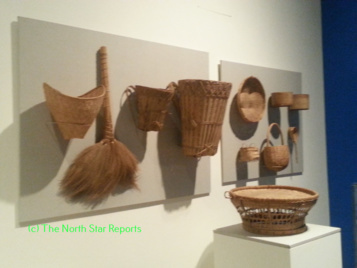 Here is an image of common household items found in a Hmong household in Southeast Asia. All of the items are made out of bamboo that was woven together to produce strong baskets for storing rice and farming produce. Brooms are also made out of bamboo to ensure strong bristles for collecting dirt when sweeping the floor. In my parents’ house in the Twin Cities, they have at least one of each items in the above photo stored in the basement. The items in my parents’ house were bought from Hmong markets that were all handmade by elders in the Hmong community in St. Paul. My parents used the broom a couple of times in the house, but the other items have never been used. . I asked my parents why the items are stored and not used. They mentioned that the bamboo items are a collection to give away as presents to me and my siblings on our respective wedding days. It is also a way to remind us of our cultural roots and where our ancestors came from. 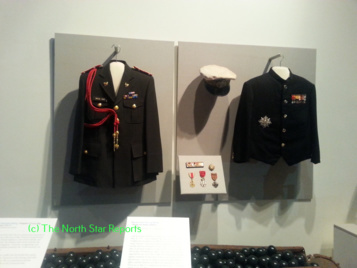 These two outfits were some of the military uniforms worn by Hmong soldiers during the Secret War. The exhibit also displayed the actual medals of two well-known Hmong soldiers: Touby Lyfoung and Col. Ly Teng ( though I am not one-hundred percent sure/ certain if these two well-known soldiers’ medals are displayed in this photo or in another section of the exhibit). 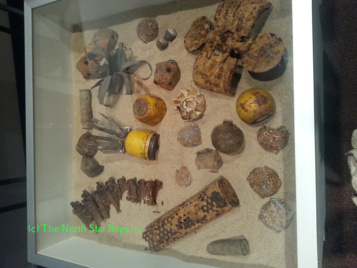 This is a display of some of the artillery remains collected from the Ho Chi Minh Trail, which was the location that had the most bombing activities. 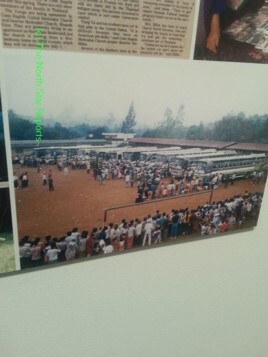 This is a photo of the bus transportation in Thailand where Hmong and other refugees were transported to the airport. Planes flew them to North America, Europe, and Australia. Not all of the refugees were granted transportation to the three locations. Only those who had family members that (who?) served with the U.S. CIA during the Secret War were granted the opportunity to be relocated. My parents were qualified to come to the U.S. because of my great-grandfather and grandfather’s involvement with the CIA. They mentioned that this was an incredibly long process and a miserable experience. This unpleasantness was due to the amount of people trying to get through. Those who were not qualified to be transported caused a scene, and most of all, many families were split up during this process. My mom got separated from my dad and grandma, but they were able to relocate each other at the airport. Lastly, this is a board showing the first few photos taken in Minnesota when the Hmong first arrived in the U.S. in 1975. 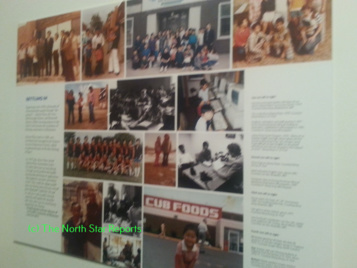 The display consists of multiple images depicting how the Hmong adapted to American life in Minnesota during the late 1970’s. The top photos are Hmong children attending school throughout the Twin Cities area and joining sports teams. In conclusion, the “We are Hmong Minnesota” exhibit was a phenomenal experience for me. It is a great way to educate the Minnesota community about who the Hmong people are. After seeing what the Hmong people and my ancestors have gone through, I value my culture and identity much more. I am also more appreciative and feel blessed that my parents are doing all they can to remind us not to forget our original roots, as represented by their passion for farming and collection of traditional bamboo baskets as wedding presents. If you are interested in visiting the “We are Hmong Minnesota” exhibit, please visit http://www.minnesotahistorycenter.org/exhibits/we-are-hmong-minnesota for more details. Bao Vang serves as Social Media Editor for The North Star Reports and is a student at The College of St. Scholastica.